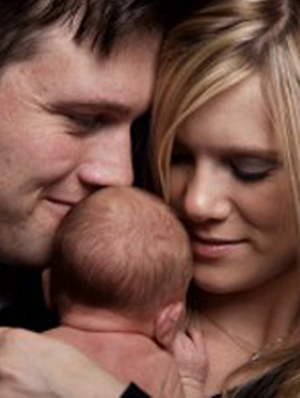 At Fertility Solutions, we have helped hundreds of couples realise their dream of having a baby and becoming parents. We are proud of our successes and would love to help you determine if fertility treatment is right for you. *Results are based on our clinic data and are subject to change, to ask a question on our results contact our team. How does Fertility Solutions report success rates? At Fertility Solutions we measure success rates by clinical pregnancy and live births per embryo transfer. This is because only an embryo that has been transferred has the potential to create a pregnancy. It is very important to understand that when viewing success rates, many factors contribute to the chance of you achieving your dream of having a baby. One of the biggest factors influencing your chance of success is female age. Note: Clinical Pregnancy is defined as a pregnancy that shows either a fetal heart or intrauterine sac on ultrasound, proof of pregnancy tissue via histology, ongoing pregnancy at 20 weeks, or definite ectopic pregnancy that has been diagnosed laparoscopically or by ultrasound. Note: Results are based on women who have used their own eggs and had an embryo (fresh or frozen) transfer between January 2015 & December 2015 within our own clinic. Data is based on both Cleavage & Blastocyst embryo transfer. Fertility Solutions offers a tiered structure comprising of four levels of service. Although the science performed in all levels of service are the same, one difference from a patient’s perspective is the choice of which day they wish to have their embryo/s transferred. For a patient choosing Bulk Billed* or Standard IVF treatment , an embryo transfer is performed on Day 2 or Day 3 of embryo development (days after the egg collection) known as a cleavage embryo transfer. Alternatively, intermediate or customised patients have the choice to proceed with a Day 5 (blastocyst embryo) transfer. A patient who has a Day 5 embryo (blastocyst) transfer, can show an increased chance of pregnancy when compared to Day 2 or 3 embryo (cleavage) transfer. This trend is observed amongst most age groups. Note: Clinical Pregnancy is defined as a pregnancy that shows either a fetal heart or intrauterine sac on ultrasound, proof of pregnancy tissue via histology, ongoing pregnancy at 20 weeks, or definite ectopic pregnancy that has been diagnosed laparoscopically or by ultrasound. Note that this graph does not represent live births, which are the number of babies born after 20 weeks. Note: Results are based on women who have used their own eggs and had a fresh embryo transfer between January 2015 & December 2016 within our own clinic. *Bulk Billed- conditions apply. Refer to Bulk Billed IVF to learn more. How can Frozen vs Fresh Embryo Transfer effect results? During an IVF treatment cycle, a patient may have an embryo transferred during that cycle (referred to as a fresh embryo transfer) and/or embryos frozen at the blastocyst stage and transferred in a subsequent cycle (referred to as a frozen embryo transfer). It is currently proposed that frozen embryo transfers may offer slightly higher success rates due to the ability to transfer an embryo in a patient’s natural cycle or non-stimulated cycle. It is thought that the stimulation drugs used during IVF treatment can affect the cells in the uterus in some women. At Fertility Solutions we freeze (vitrify) all suitable embryos on Day 5 or 6 and expect 90-95% of embryos that are frozen to survive the freezing/thawing process. Unfortunately, not all embryos are suitable for freezing. For those patients who have a frozen embryo transfer they can expect to have a 28-47% for a clinical pregnancy and 26-42% chance for a live birth depending on female age. 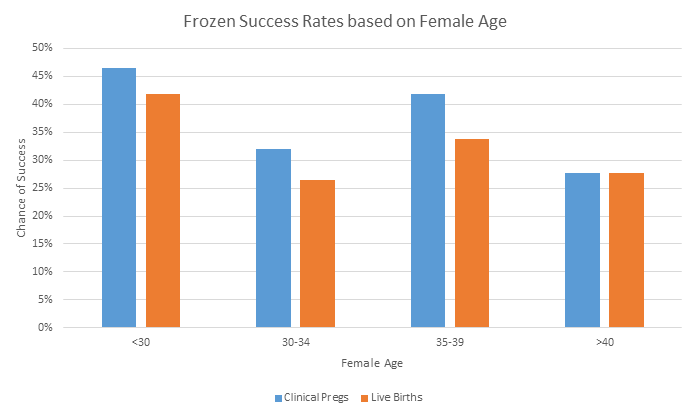 Refer to the below graph for results on Frozen Clinical Pregnancy and Live Births Based on Female Age. Note: Results are based on women who have used their own eggs and had a frozen embryo transfer between January 2014 & December 2015 within our own clinic. Data is based on both Cleavage & Blastocyst embryo transfer. How can our Low Cost Intermediate IVF option improve pregnancy success? Our Low Cost Intermediate IVF cycle gives patients the option of having their embryo transferred at a more advanced Day 5 stage (blastocyst). Some other low cost clinics only give patients the option of a Day 2 or 3 (cleavage) transfer. Research suggests that embryos transferred at a more advanced stage have a higher chance of resulting in a pregnancy and also reduces the number of embryo transfers (and therefore costs) that couples need to undertake. 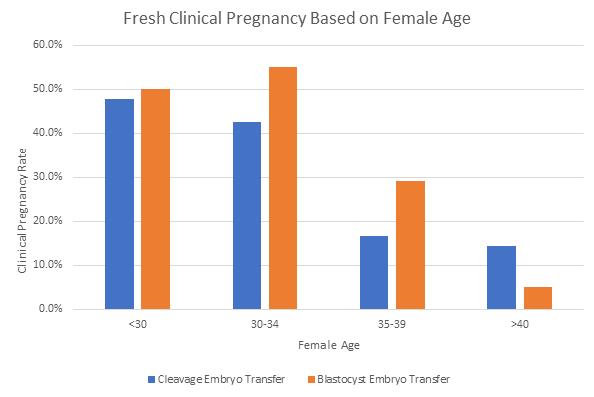 The below graph is our clinic results for Fresh Clinical Pregnancy Based on Female Age, that show patient success rates with a cleavage (Day 2or 3) transfer vs blastocyst (Day 5) transfer. Patients whom have a blastocyst embryo transfer can show an increased chance of pregnancy when compared to a cleavage embryo transfer; this trend is observed amongst most age groups. Unfortunately not all pregnancies, even those conceived naturally, will result in the birth of a baby – with the natural miscarriage rate being around 25%. Although IVF treatment can help reduce some of this loss, it cannot be completely eliminated. One of the main reasons for miscarriage is genetic abnormalities in the embryo, such as an incorrect number of chromosomes. Unfortunately as a woman ages, so do her eggs subsequently increasing the incidence of genetic abnormalities within the egg or embryo. For more information on this refer to Genetic Testing of Embryos. Our current data does not include any embryos that have been genetically tested, which could enhance these live birth rates. Therefore based on our data, the chance of you taking home a baby after treatment ranges from 13.9%-40.8%, depending on female age. Note: This data is based on our clinic results and on women who have used their own eggs and had an embryo (Fresh or Frozen) transfer between January 2015 & December 2015 within our clinic. Additionally this data is on both cleavage and blastocyst embryo transfer. 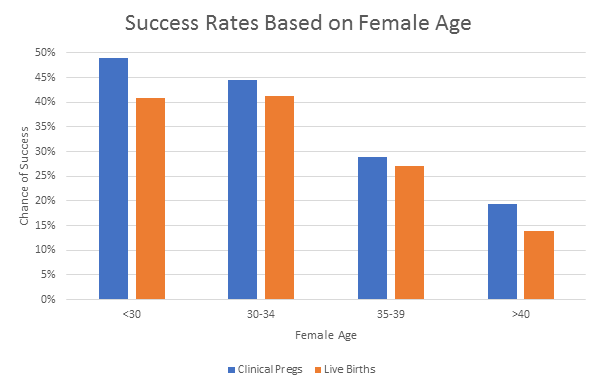 To calculate your individual live birth success rate based on our clinic data, please enter your age in the above graph. The team at Fertility Solutions are committed to offering our patients the best possible chance of success. Our results are on a par with any of the major clinics locally and around Australia, so you can feel confident that when you choose to have treatment with us, you will experience the personalised touch of a small clinic without limiting your chances of success. Success rates are an important consideration for patients when choosing an IVF clinic. At Fertility Solutions, we believe it is important to provide patients with realistic expectations and information, so that you can make an informed decision about your treatment. Success rates can be difficult to understand and compare between clinics, due to the different ways that they can be presented and/or measured. The word SUCCESS can often be defined differently by each fertility clinic and therefore the data can be confusing or misleading if you don’t have a clear understanding on what is actually presented. Success rates also vary based on a number of board factors such as age, weight, and cause of fertility. Additionally not every treatment cycle will result in an egg collection, an embryo transfer or embryos to freeze. Further information can be obtained by speaking with your specialist or referring to the Fertility Society of Australia statement on ‘Interpreting Pregnancy Rates: a consumer guide’ – Click Here to Access this Guide. Clinical Pregnancy – refers to a pregnancy, as defined by Australian and New Zealand Assisted Reproduction Database (ANZARD) as either the presence of a fetal heart or intrauterine sac on ultrasound, proof of pregnancy tissue via histology, ongoing pregnancy at 20 weeks, or definite ectopic pregnancy that has been diagnosed laparoscopically or by ultrasound. Our quality management processes closely monitor our pregnancy rates, which mean that we are continually striving to maintain and improve our success rates. Please call our information line on 1300 FERTILITY (337 8450) or request your free one-on-one private consultation with a Fertility Nurse.